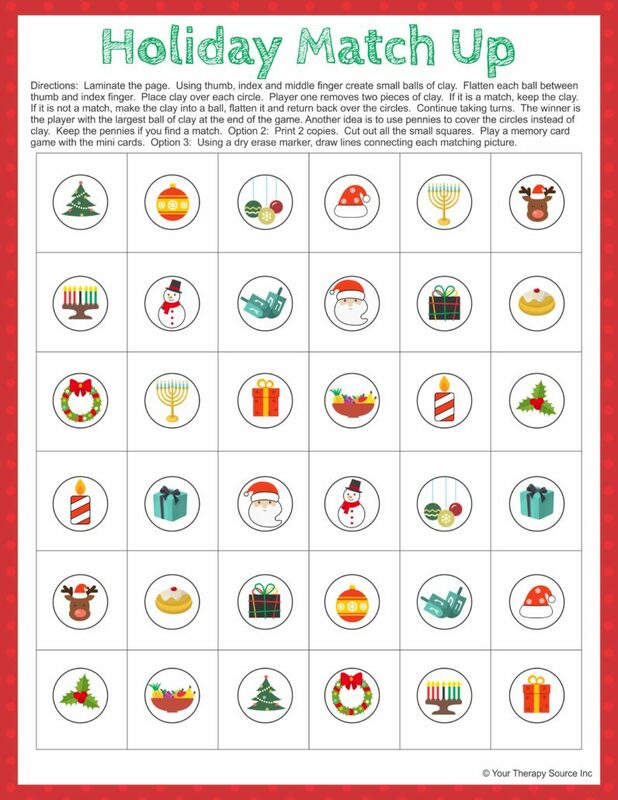 Check out this FREE Holiday Match Up activity from the December Packet. Print and laminate the page. Using thumb, index and middle finger create small balls of clay. Flatten each ball between thumb and index finger. Place clay over each circle. Player one removes two pieces of clay. If it is a match, keep the clay. If it is not a match, make the clay into a ball, flatten it and return back over the circles. Continue taking turns. The winner is the player with the largest ball of clay at the end of the game. Try to use pennies to cover the circles instead of clay. Keep the pennies if you find a match. Play a game on mini memory. Print 2 copies. Cut out all the small squares. Play a memory card game with the mini cards. Want to add in visual motor skills? Use a dry erase marker, draw lines connecting each matching picture. 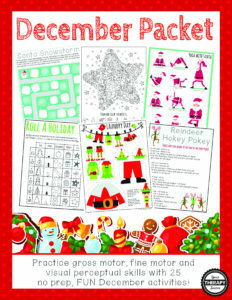 December Packet: Practice fine motor, gross motor, visual perceptual and handwriting activities with this no-prep, fun, December themed packet. Includes 25 activities to print and play! Find out more.